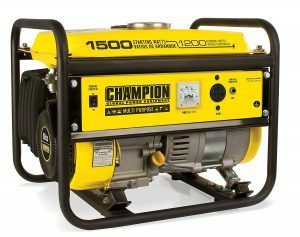 As one of the leading manufacturers of generators for personal use, Champion is known for offering a wide range of models with varying capacity to meet the specific needs of every family. The brand has units running on different types of fuel and this makes the selection even greater. It is also among the innovators in the industry and frequently introduces advanced features in its latest creations. Given all this, it is natural to have high expectations about the best Champion generators features here. While the best models stand out with their features, capabilities and qualities, it is up to you to decide which one will match your individual needs and requirements best. When making a choice, you should focus on factors such as ease of use, portability, performance and maintenance requirements. Undoubtedly, the most important thing which you have to consider when choosing among the best Champion generators is the capacity that you require. Whether you will use the unit for getting backup power in your home or for powering your RV’s AC and a few small items, you should have a clear idea of your needs to make the right decision. 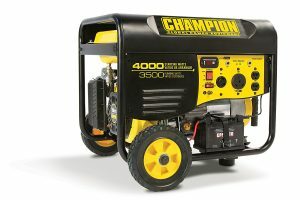 Check out the best generators in the Champion range in greater detail now. Thanks to the inverter technology of this generator, you will get clean power with THD below 3% which is safe for powering and charging all devices with microprocessors that you can think of, from your computer and smartphone to your flat-screen TV. With Champion 75537i, you get 3000 watts of surge power and 2800 watts of running power. This capacity is quite larger for an inverter generator. While this model is certainly not one of the smallest and lightest, it’s pretty compact and easy to fit in the back of the car or in a small enclosure. 171cc single cylinder, 4-stroke OHV engine – It runs smoothly and dependably. This is what you’d expect from one of the best Champion generators. Wireless remote with an 80-foot range – It’s great to be able to start and stop the engine without having to go outside. 8 hours of runtime at 1/4 load – This is quite good for an inverter generator. 2 120V 20A household and 2 12V DC outlets in addition to the RV one – These give you some flexibility to plug appliances and charge batteries directly. Noise production of 58 dB at 23 feet – This is fine for an inverter generator. Carrying handles and a mobility kit including two heels and a pushing/pulling handle- It’s easy to take the Champion 75537i generator around. USB adapter – The automotive adapter included in the package makes charging electronic devices a breeze. 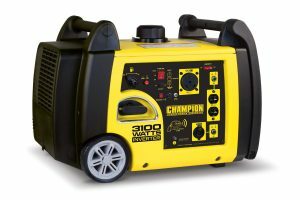 Fairly compact yet quite powerful, this portable generator can easily meet both your basic power backup needs and your RV needs. It produces 4000 watts of surge power and 3500 wats of continuous power. Given the capacity of Champion 46539, you can easily power some lights, a fridge, a fan and a coffee maker at the same time, for example. Thanks to the integrated RV receptacle, you can run the air conditioner in your RV directly when using this generator. It works with AC systems of up to 15,000 BTU. 196cc Champion single-cylinder OHV engine – It operates smoothly and dependably, provided that you keep the oil level optimal. Wireless remote and electric start – The first one enables you to start and stop the generator from up to 80 feet away. Quite convenient, right? Cold Start technology – Even if it’s cold outside, the engine will begin to work instantly. 12 hours of runtime at 1/2 load with a full fuel tank whose capacity is 3.8 gallons – This is quite impressive. 2 120V 20A household outlets, 1 120V 30A locking outlet and 1 120V 30A RV (TT-30R) outlet – These give you some flexibility when using the unit. Volt Guard – A valuable safety feature providing protection from voltage spikes. Intelligauge – A practical feature for monitoring power output and determining maintenance intervals. Folding handle and never-flat tires – These features give the unit great mobility. The noise level is 68 dB from 23 feet – It’s not high at all given the capacity of the Champion 46539 generator. With its rating of 1500 starting watts and 1200 running watts, this model can serve some basic needs when you are camping outdoors or using tools in the back yard. You can also use it to power some lights in your house plus a microwave and/or a fan in case of an emergency. The compact size is undoubtedly one of the major advantages of the Champion 42436 portable generator. Given that it is small and light, you can easily carry it around by hand. It will also fit easily in an RV. The strong steel frame provides protection during transportation and use. 80cc Champion single-cylinder OHV engine – Superbly working engine built to last. Cold Start technology – Quick engine start and dependable performance even in cold weather. Runtime of 10 hours at 1/2 capacity and a full tank, whose volume is 1.5 gallons – This is quite good for a compact model. 1 120V 20A household outlet – This corresponds to the capacity of the model, but naturally more outlets will always come in handy. Volt Guard – Works reliably to provide protection against voltage spikes. Low-oil shutoff sensor – An essential safety feature which is considered to be standard. Voltmeter With it, you can keep a check on the power output. When the unit is 23 feet away, the noise level is 65 dB – This makes Champion 42436 quieter than many of its counterparts.